A new bicycle index has ranked the 20 most bicycle-friendly cities in the world. Already world-renowned bike-friendly cities such as Copenhagen and Amsterdam are of course on the list. But there are several newcomers as well, such as Malmö in Sweden and Seville in Spain. Unfortunately, there is still no US city on the top 20 list. 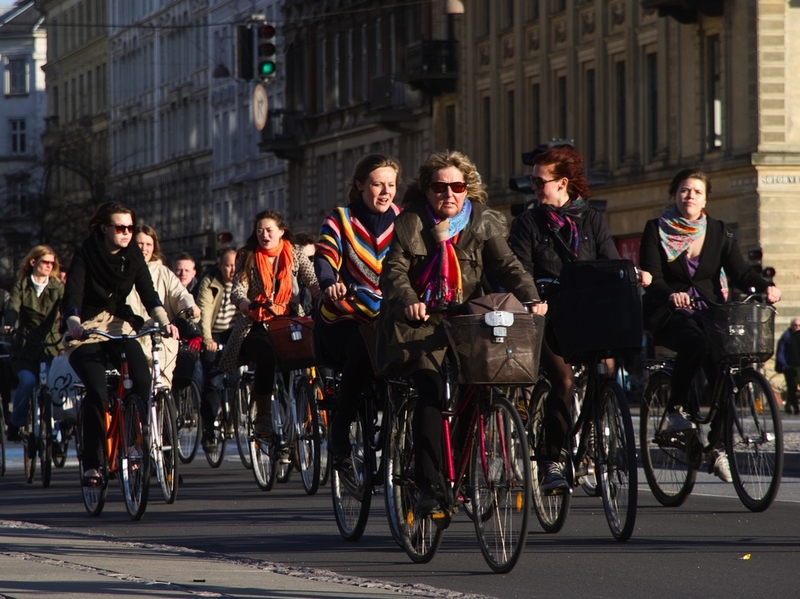 The new Copenhagenize Index has ranked the 20 most bicycle-friendly cities in the world. The index, which ranks a total of 150 cities, has been compiled by Copenhagenize Design, an urban planning consultancy who specializes in bicycle planning. More than 400 people from around the world has helped rank the various cities. Each city have been ranked on the basis of 13 different parameters that takes everything from the availability of satisfying bicycle infrastructure and facilities to the overall bicycle culture in the city and the political climate regarding urban cycling into account. Unsurprisingly, especially considering it already has a world-renowned reputation of being a bike-friendly city, Amsterdam in the Netherlands is ranked as the most bicycle-friendly city in the world. "The cycling atmosphere is relaxed, enjoyable, and as mainstream as you can get. This is the one place on the planet where fear-mongering about cycling is non-existent and it shows. There are few places we enjoy urban cycling as much as in Amsterdam," the Copenhagenize Index says. The photo shows afternoon traffic on the world's busiest bicycle street in Copenhagen, Denmark. Photo by Copenhagenize Design Co.
Copenhagen is ranked as the second most bicycle-friendly city in the world. No other city beats Copenhagen when it comes to "a well-designed and uniform bicycle infrastructure network. "But the Index warns that a lack of clear political leadership and new massive car infrastructure projects makes Copenhagen's future seem uncertain and bleak for cyclists. Utrecht, yet another Dutch city on the top 20 list, is the third most bicycle-friendly city in the world. The Index highlights the "fantastic" infrastructure that can be found in the small city. According to the Index, Utrecht is a "world-leader" and "a splendid city" for cyclists. But the city, just like Amsterdam, haven't seen much new significant progress lately. So to avoid getting stuck in status quo the Index calls for increased efforts, more creative thinking and innovation to improve cycling conditions even further. "With urbanisation on the rise, the city needs to move forward in order to accommodate more cycling cities and really establish themselves as leaders of the future, not just the present," the Index asserts. If you want more information on why these cities rank the way they do just check out the Copenhagenize website, which has extended explanations on the different pros and cons of each of the top 20 cities. While the majority of the top-scoring cities are located in Europe, the US still has no city that can compete with more bike-friendly cities such as Copenhagen in Denmark, Tokyo in Japan, Rio in Brazil or Montreal in Canada. But the League of American Bicyclists recently released their yearly ranking of the most bicycle-friendly states in the US. 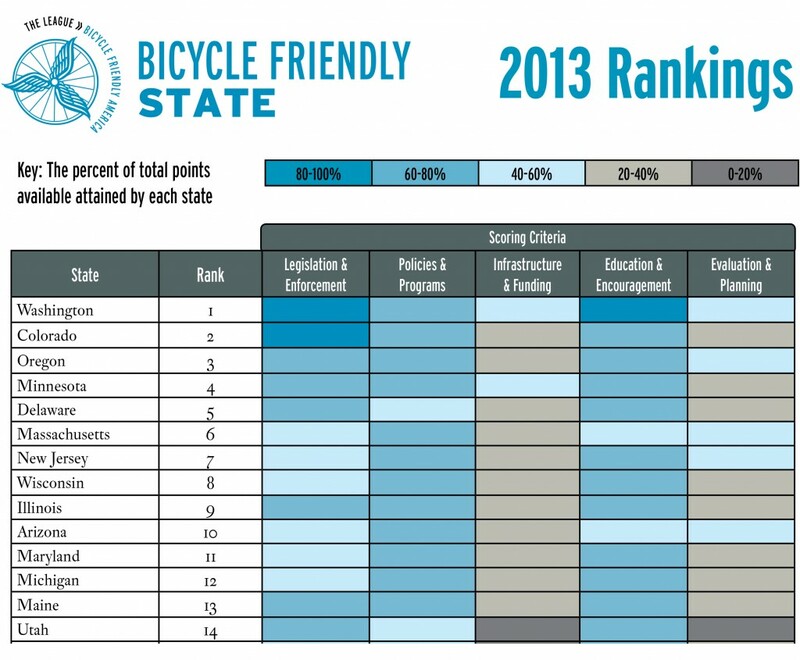 Their list shows how Washington continues to be the most bike-friendly state in the country. Washington has a good performance in all of the five categories. The state gets especially good grades when it comes to its work on legislation, education and its encouragement to get more people to use their bikes. "We're encouraged to see significant progress in top states like Washington, Delaware, Colorado and Oregon," says League President, Andy Clarke. "But as the scores clearly highlight, there's much work to be done in critical areas like infrastructure and planning in every state." The 14 most bicycle-friendly states are: Washington, Colorado, Oregon, Minnesota, Delaware, Massachusetts, New Jersey, Wisconsin, Illinois, Arizona, Maryland, Michigan, Maine and Utah on 14th place.